Left to Right (Photo 1): Brad Macloves, Almarie Macloves, Samantha Alvarado, Kimo Kai, Kalani Stephens & Drew Santos. Left to Right (Photo 2): Parents of Mason Kekoa, Almarie & Brad Macloves. Mason Kekoa Macloves, son of Brad and Almarie Macloves, passed away from sepsis just two days shy of turning 8 months old, on February 3, 2016. 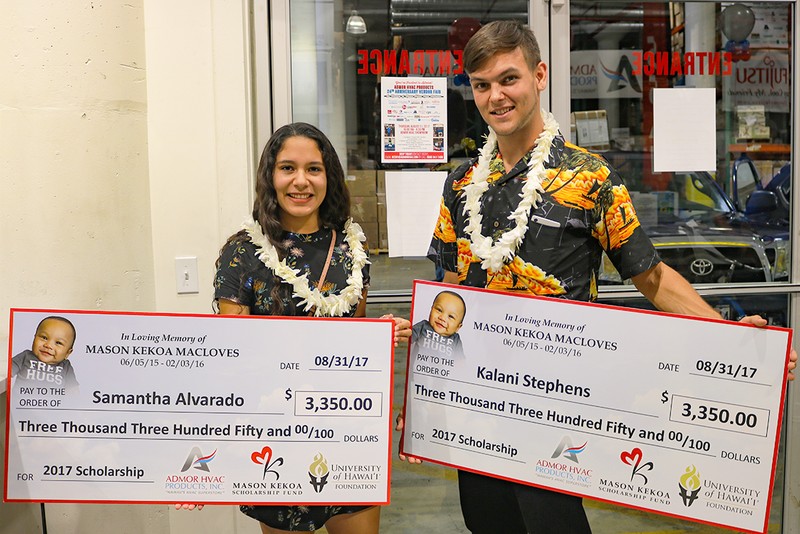 In an effort to honor his memory and raise sepsis awareness, a scholarship fund with the University of Hawaii Foundation was created in Mason’s name by Admor HVAC Products, Inc.
On August 31, 2017, during Admor HVAC’s 24th Anniversary Events, the first scholarships were awarded to UH Manoa students Kalani Stephens and Samantha Alvarado. Both recipients received $3,350 each, making the total of $6,700 for our very first scholarship! Kalani is a graduate of Lahainaluna High School, Class of 2013. He attends UH Manoa and majors in Economics and Asian Studies. Kalani has studied abroad in Korea, China and Japan, and speaks fluent Korean and Chinese. While abroad, Kalani was exposed to poverty stricken areas and has developed a passion for helping the less fortunate. He is set to graduate with his Bachelor’s degree in the spring of 2018 and will continue with graduate school at UH Manoa. Upon the completion of his schooling, Kalani hopes to become a geography professor and someday start a non-profit that aids under-developed countries with receiving necessities like healthcare and clean water while helping to improve unnecessary mortality rates especially in infants and children through preventative care. When asked how the Mason Kekoa Scholarship will help him, Kalani replied: It’s life changing. I’ve had to pay for my entire schooling myself and it helps me tremendously. The scholarship has paid for my tuition for this semester and the next. I even have some left to cover some of my books. Thank you so much! Samantha is a graduate of Mililani High School, Class of 2015. She attends UH Manoa and majors in Natural Resources and Environmental Management. Samantha is set to graduate a year early, receiving her Bachelor’s degree in the spring of 2018. She plans to attend graduate school at UH Manoa in the fall to advance her education in the environmental conservation and education sectors. Upon completion of schooling, Samantha hopes to become a Hawaii high school educator while helping to preserve Hawaii’s incredible ecosystems and serving her community. Her greatest goal is to inspire the students she teaches, that they too can be the change they wish to see in the world. Samantha took the time to write a thank you letter, and in it she says: I never would have been able to cover the costs of school through my employment alone nor have been able to dedicate enough time to my studies had I been too preoccupied with working full time. I cannot express what a wonderful thing this scholarship opportunity is for a student such as myself, and what a great impact it has had on my life. I hope that my efforts as a land manager and an educator serve you well. CONGRATULATIONS Kalani and Samantha! We wish you the best of luck in all of your future endeavors. To learn more about Mason or how you can donate to his memorial scholarship, please visit www.masonkekoa.com. Thank you donors for your contribution and we look forward to your continued support!